Tunetalk - Data Plans for Everything. All the time! Now you can enjoy MORE data at a LOWER price! Choose from our range of awesome data plans which suits your online lifestyle. Thinking of how to get MORE data from your Datatata Plan? I cannot login to my Tune Talk account. No worries, you can still subscribe via SMS. How Do I Add Extra Data Plan? How Do I Check my Data Plan Status? How Do I Unsubscribe my Data Plan? The New Plans are valid for all existing and new Tune Talk subscribers only from 16th October 2017 until further notice. Tone Excel, Tone Plus subscribers are excluded. 300MB Daily Plan - 300MB allocation for 1 day within a 24 hours scope from the time of subscription until 11:59pm at the cost of RM1.00 per day. For example if you subscribe to the plan on 1st September 2018 at 12:01am your usage will last until 1st September 2018 at 11:59pm. If you subscribe to the plan on 1st September 2018 at 10:00pm your usage will last until 11:59pm..
2GB Weekly Plan – 2GB allocation for 1 week (7 days) from date and time of subscription at the cost of RM9.00 per week. 4GB Monthly Plan - 4GB allocation for 1 month (30 days), 400 minutes’ worth of airtime for on-network local calls and 100 minutes’ worth of airtime for off-network local calls in a Promo Bucket from date and time of subscription at the cost of RM28.00 per month. 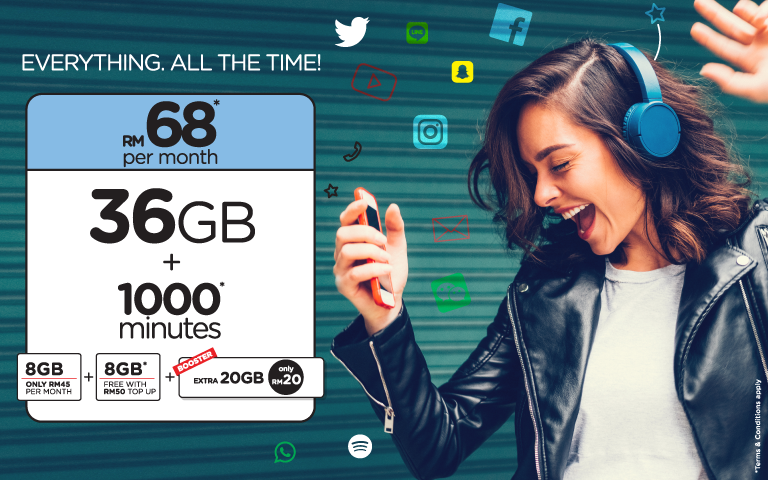 8GB Monthly Plan - 8GB allocation for 1 month (30 days), 700 minutes’ worth of airtime for on-network local calls and 300 minutes’ worth of airtime for off-network local calls in a Promo Bucket from date and time of subscription at the cost of RM48.00 per month. 120GB* Yearly Plan - 10GB* allocation per month (30 days) for 12 months from date and time of subscription at the cost of RM200 per year and comes with 360 days airtime validity from date of subscription. For the 4GB & 8GB Monthly Plans, the airtime within the Promo Bucket can be used for ON-NETWORK Local Calls ONLY until the allotted airtime is exhausted, whereupon the airtime credit within the subscribers main Tune Talk prepaid balance will start to be utilized at standard Tune Talk call rates. The Plans with 1 day validity are valid from the time of subscription until 11:59pm on the same day of subscription. The Plans will be auto-renewed within 12:00am midnight to 1:00am. The Plans will be auto renewed upon validity expiry. In the event the Data Quota is exhausted before the expiry, users can get an additional Data Quota by sending the desired keyword to 2222. Please note that any unused data quota from the previous subscription does not carry forward. 120GB Yearly Plan – type “2G ADD” and send to 2222. For TUNE TALK subscribers, this adds a 2GB quota that is valid for the remainder of the cycle until the next 10GB allocation is granted. The 2GB add-on is charged at RM15. Any data usage after the Data Quota is totally exhausted will be charged at current Pay Per Use rates and it is valid. After 90% of the Data Quota has been utilised, a usage notification will be sent to the subscriber and remaining available Data Quota can be checked by dialling *134#. Subscribers can only subscribe to 1(one) Plan at any one time. For subscribers that are already subscribed to an existing data plan, subscribing to a new plan will supersede their current plan and any unused data quota and any unused Local Voice minutes will be forfeited. Subscribers that subscribe to the 120GB Yearly Plan will NOT be able to subscribe to any other data plan unless they unsubscribe from the Plan first. To unsubscribe from the plan please refer to Clause 15 (f). All un-used data balance will be forfeited and refunds will not be valid.